Q: What kind of passport and/or ID requirements are needed to enter the United States of America? Q: What’s the legal drinking age in the United States? A: 21 years of age. Government issued photo ID must be presented to show proof of age in order to drink alcoholic beverages. Photocopies of IDs are unacceptable by law. Q: When is the best time to book flights? Q: How far is the hotel from the airport? A: Rosen Inn at Pointe Orlando is 12 miles (about 20 minutes) from the Orlando International Airport. Our on-site taxi provider Platinum Transportation offers airport shuttle services. Contact them in advance of your arrival at PlatinumTransportation.com or by calling locally at (407) 492-8888 for quick service between the airport and hotel. Q: How close is the Orange County Convention Center? 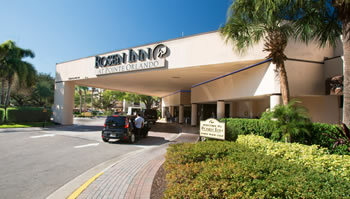 A: Rosen Inn at Pointe Orlando is within walking distance (less than one mile) to the Orange County Convention Center. Q: How close is the hotel to the major theme parks? A: The hotel is 2 miles from Aquatica®, 2.4 miles from SeaWorld®, 2.7 miles from Discovery Cove, 3.5 miles from Universal Orlando Resort™, and 7 miles from Walt Disney World® Resort. For a list of more attractions and distances, please visit the Orlando Area Attractions page. Q: How can I obtain tickets to attractions like Universal Orlando Resort™, Walt Disney World®, and SeaWorld®? A: The staff at the Universal Partner Hotel Vacation Planning Center in the Lobby is happy to assist guests with purchasing theme park tickets. You can also check out our packages at the bottom of each website page for current deals on theme park ticket and hotel stay purchases. Click Here to purchase theme park tickets online through the hotel. Q: What perks do guests enjoy for staying at a Universal Partner Hotel? A:Guests enjoy discounts on merchancdise at select Universal Orlando™ theme park locations and Blue man Group, on food and non-alcoholic beverages at select Universal Orlando theme park locations and Universal’s CityWalk™, free scheduled transportation to Universal Orlando theme parks, and much more. Visit the Universal Partner Hotel Vacation Planning Center, also known as the guest services desk, where staff can help you purchase attraction tickets, make reservations for scheduled shuttle services and for restaurants, arrange other transportation, assist in car rentals, and much more. Free theme park shuttle service reservations must be made in person at the Universal Partner Hotel Vacation Planning Center located in the hotel lobby 24 hour prior to departure. Click Here to learn more about these benefits. Q: Is the Rosen Inn at Pointe Orlando hotel rated by AAA? A: Yes. Rosen Inn at Pointe Orlando is a AAA Three Diamond rated hotel. Q: Are there shuttles to the area attractions, shopping, and the airport? A: Rosen Inn at Pointe Orlando offers free shuttles to Universal Orlando Resort™, SeaWorld®, and Aquatica®. Reservations must be made in person at the Universal Partner Hotel Vacation Planning Center located in the hotel lobby 24 hour prior to departure. Shuttles to Walt Disney World® theme parks are available for a nominal fee. Our on-site taxi provider Platinum Transportation offers airport shuttle services. Contact them in advance of your arrival at www.PlatinumTransportation.com or by calling locally at (407) 492-8888 for quick service between the airport and hotel. Q: Is there an on-site car rental agency? A: For your convenience, Enterprise® car rental maintains a fleet of vehicles at our nearby sister hotel, the Rosen Centre Hotel. For booking information, please contact Guest Services/Attractions Desk (407) 398-0526 or (800) 261-7331. Q: How old do you have to be to rent a car? A: Minimum rental age is 21 years old, although larger rental car agencies only accept drivers 25 years of age or older. The rental car agencies that accept younger drivers require the driver to present a credit card and charge extra “underage” fees. Check with your car rental agent for more information. Q: Where can I find information on cool things to do while visiting Orlando? A: Right across the street is Pointe Orlando, International Drive’s premier entertainment and shopping complex. Feel free to check out the Theme Park Events and Central Florida Events page for more ideas on what to do while in Orlando. Another great source for fun suggestions is the Blog pages. Q: How old do you have to be to make guestroom reservations? A: You have to be at least 18 years old. A: Check-in is at 4 p.m. Check-out is by 11 a.m. Late check-out is available, but a fee may apply. Q: How do I book my event, like a wedding or family gathering, at the hotel? A: Rosen Inn at Pointe Orlando has meeting space perfect for your wedding, family reunion, special event, or a group gathering. We have many special group discounts including room blocks, discounted guestroom rates, and other perks. Contact the Director of Sales at Rosen Inn at Pointe Orlando for more information or submit a Request for Proposal. Q: What are my dining options? A: Rosen Inn at Pointe Orlando offers excellent, on-site restaurants, as well as light and to-go meals and snacks in the Lite Bite Mini-Market & Deli. View more dining options and details on the In-house Dining & Recreation page. Q: Do your restaurants offer specials for families? A: We have a Kids Eat Free Program for children under 5 with each paying adult at the Plaza Garden Restaurant. Discount pricing is available for kids ages 6 to 10. Seniors (55+) enjoy a 25% dinner discount all night at Plaza Garden Restaurant (available for the buffet only). Ask your server for details. Limit one child’s buffet meal free per one paid adult buffet meal. Q: Are there any other on-site entertainment options? A: Rosen Inn at Pointe Orlando has three swimming pools. Pools 1 and 3 are heated seasonally and Pool 3 is a non-smoking pool. Also available are a children’s playground area and a video arcade game room with an outdoor pool table. Guest also enjoy regular entertainment and karaoke on most nights at Zebra’s Sports Bar & Grille. Q: What if I want to play golf? A: Our sister hotel, Rosen Shingle Creek, has an excellent golf course marked as challenging yet enjoyable by all skill level golf players. Book your tee time and game by calling the Shingle Creek Golf Pro Shop at (866) 996-9933. Q: Where can I keep my travelers checks and other valuables? A: Every guestroom comes with an electronic safe large enough for a laptop, which is available to you at no charge. Q: May I bring my pet? A: Yes! Pets are welcome. There is a daily pet fee of $15 per pet, per room, plus tax. For the safety of our guests, employees, we ask guests and their accompanying pets follow a few basic rules and guidelines. Please check with the hotel for a full list of guidelines or view the online Pet Policy. Q: Do you have non-smoking rooms available? A: Every guestroom is non-smoking. There are designated smoking areas outside near the guestrooms. Q: What accommodations are in the ADA compliant guestrooms? A: ADA compliant guestrooms may include lever handles on all doors, transfer benches, lower towel rack, ADA compliant toilet, hand-held shower wand, an accessible closet, a strobe light on the fire alarm, grab bars, and closed captioning on the TV. Visit the Accessibility page for more information and services. Q: How do I book an ADA compliant guestroom? A: Please book online or call the hotel to book an ADA compliant guestroom: 1-800-999-7300. Q: What appliances are included in each guestroom? A: Every guestroom come with a mini-refrigerator, microwave, single-serve coffee maker, iron and iron board, hairdryer, safe, TV, alarm clock with USB port, and more. Mini-refrigerators do not come with a freezer. Baby cribs are provided free upon request and an extra rollaway bed may be added to your room for a small daily fee. Q: Do you have any unique amenities that could make our stay more special? A: Absolutely! If you’re looking to create a personalized experience, we can help with a variety of in-room gift baskets, treatments, flower arrangements, candy and chocolate spreads. View the Amenities page for a complete list of packages and instructions on how to order. Q: What are your parking arrangements? A: Rosen Inn at Pointe Orlando offers free, 24-hour-secured gated parking with plenty of room for buses and RVs. Parking is free for each guest’s first two cars. Afterward, each of the guest’s additional cars will be charged a $5 per night, per car parking fee. Q: Does the hotel have laundry facilities and offer dry cleaning services? A: Yes. Four coin-operated self-serve laundry facilities are located throughout the hotel. For valet dry cleaning or laundry service, please contact the front desk. A: Rosen Inn at Pointe Orlando accepts only chip enabled cards from the following carriers: Visa, MasterCard, American Express, Discover, Diners Club/Carte Blanch, Encore, and JCB. We also accept Google Play, Samsung Pay, and Apple Pay. Q: Do the hotels offer business services? A: Business services include faxing, copying, package receiving, and computer kiosks. Package handling service fees are $10 per box under 50 lbs and $25 per box over 50 lbs, and will apply to any boxes delivered to hotel. Packages will be shipped only with prepaid labels. No refrigerated storage is available. Contact the Business Center or email info9000@roseninns.com for policies and additional pricing information.